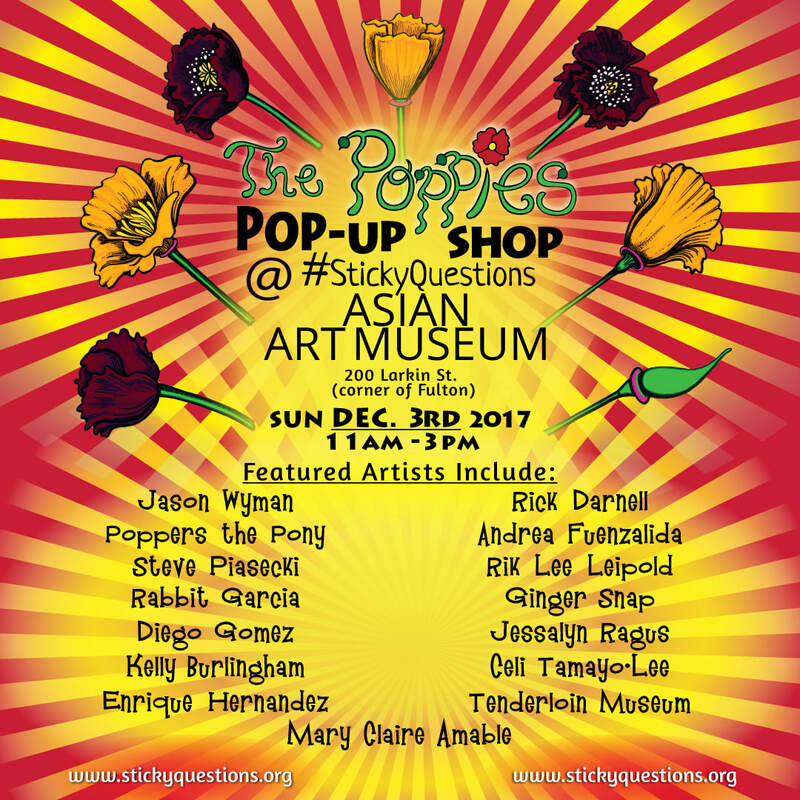 #StickyQuestions is thrilled to be partnering with The Poppies, A Pop-Up Shop, for a unique holiday boutique and maker space just in time for the holidays. On Sunday, December 3, artists, artisans, mystics, and makers will take over Fulton Street at Larkin in front of the Asian Art Museum. Neighbors will be invited to check out the wares of local Tenderloin / SOMA / San Francisco artists including glassware, paintings, digital photography, illustration, sound installations, and more. Don't have $$ to spend for the holiday craze? Well then, The Poppies Pop Up @ #StickyQuestions has you covered! In addition to artist vendors, The Poppies will feature interactive art-making stations, including a button and zine making station hosted by Crystal Mason, Trayvon Smith, Chazorae Bell, and the ArtSpeak Interns AND booths by Academy of Art University MFA Students. At these maker tables, neighbors will be encouraged to make things to give away rather than keep. 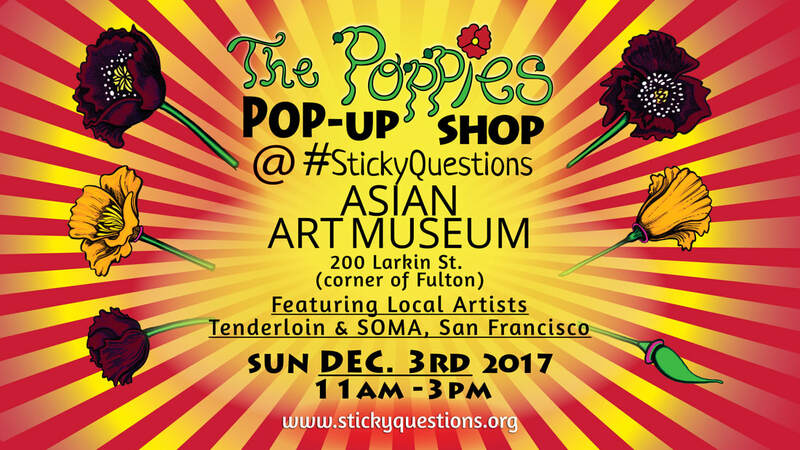 The Poppies Pop Up @ #StickyQuestions is a celebration of the spirit of the all holiday seasons, where conviviality, neighborliness, sharing, and community are foregrounded and centered. It is the perfect respite amidst the holiday craze and offers all neighbors an opportunity to meet someone new, create something to give, and find something local to purchase. The Poppies Pop Up Shops launched in Spring 2017 as a means for artists & healers to connect with their neighbors. The Mission District of San Francisco. Since the Spring, it has produced events at The Red Poppy Art House, a cultural venue on 23rd Street, and ISSO SF, a small boutique retailer on 19th Street, SF. Inaugural artists / healers included Andrea Fuenzalida, Keegan Roberson, Donna Marchesano, Julz Hale Mary, Steve Piasecki, Ginger Snap, and Jason Wyman.